In some late games, the S ROM 128KiB size limit was expanded with the use of NEO-CMC chips. This was devised as some sort of hack, taking advantage that the VDC continues rendering the fix layer outside of the visible screen area. This allows the chips to use the normally unused $7500~$75FF VRAM region to add bits to the tile numbers. The chips use latches to store the additional bits at the beginning of a line, and "distributes" them during render. Synchronization might just be free running, started by /RESET and clocked with 6MB ? Games marked [*] do hold 512KB fix data, however they ultimately only use a 128KB section, making the banking mechanism pointless. NEO-CMC 042 has been observed using type 1 only. NEO-CMC 050 has been observed using both type 1 and type 2. Infos from Mr K (MAME). Type 1 allows fix data up to 512KiB (16384 tiles instead of 4096), by changing the bank (4 maximum) for groups of 2 line of tiles (or more ?). For this, the $7500~$75BF area in VRAM is used. The $7500~$753F area even words (32 total) contain a flag to indicate if the bank has to be changed for the corresponding tile line. The $7580~$75BF area even words (32 total) contain bank numbers for each of the tile lines. If for a given line, the flag is set to $0200 (group size ? ), the bank is read, changed, and will remain the same until it's changed again (it doesn't go back to 0 if the next line doesn't have the flag set). Bank bits are inverted (00 = bank 3, 11 = bank 0). Type 2 allows to add 2 bits to all the fix tile indexes individually, also allowing to use 16384 tiles at most but in a simpler manner and with no restrictions. For this, the $7500~$75DF area of VRAM is used. Those bank bits are inverted (00 = bank 3, 11 = bank 0). The words are organized as in the fix map for a PAL screen (first and last lines aren't used): from top to bottom and left to right. 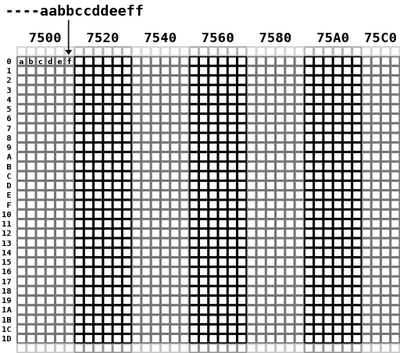 The "e" and "f" group of bits are unused in the last column ($75C0+).